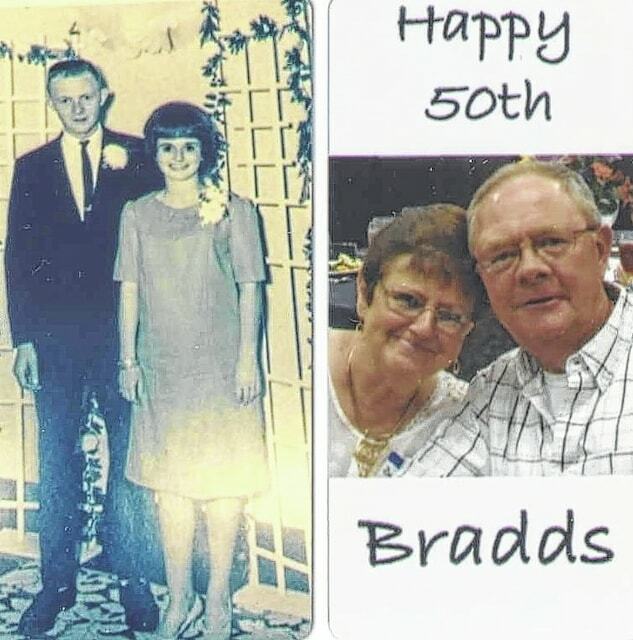 Stephen Blaine Bradds and Brenda Sue (Melvin) Bradds, of Bowersville/Hillsboro, will celebrate their 50th wedding anniversary on Saturday, June 27. They were married on June 29, 1965. In honor of the occasion, the couple is having a reception at Blaine and Tammy’s house from 2 – 5 p.m. Friends are invited to attend. Stephen and Brenda are the parents of D’anne Sweet (Jerry) and Blaine Bradds (Tammy), of Hillsboro. They have two grandchildren, Anthony and Zachary Bradds; four step-grandchildren, James, Brittany, and Jesse; one great-grandchild, Raelynn Bradds; four step-great-grandchildren, Brianna, Jayden, Kayleigh, and baby James; and Steve’s best friends Lucy and Jenny (dogs), and the one and only “Miss Kitty Bell” (cat). Stephen Blaine Bradds and Brenda Sue (Melvin) Bradds, of Bowersville/Hillsboro, will celebrate their 50th wedding anniversary on Saturday, June 27. They were married on June 29, 1965. In honor of the occasion, the couple is having a reception at Blaine and Tammy’s house from 2 – 5 p.m. Friends are invited to attend. Stephen and Brenda are the parents of D’anne Sweet (Jerry) and Blaine Bradds (Tammy), of Hillsboro. They have two grandchildren, Anthony and Zachary Bradds; four step-grandchildren, James, Brittany, and Jesse; one great-grandchild, Raelynn Bradds; four step-great-grandchildren, Brianna, Jayden, Kayleigh, and baby James; and Steve’s best friends Lucy and Jenny (dogs), and the one and only “Miss Kitty Bell” (cat).